Part 40 of Wonders of World Engineering was published on Tuesday 30th November 1937, price 7d. 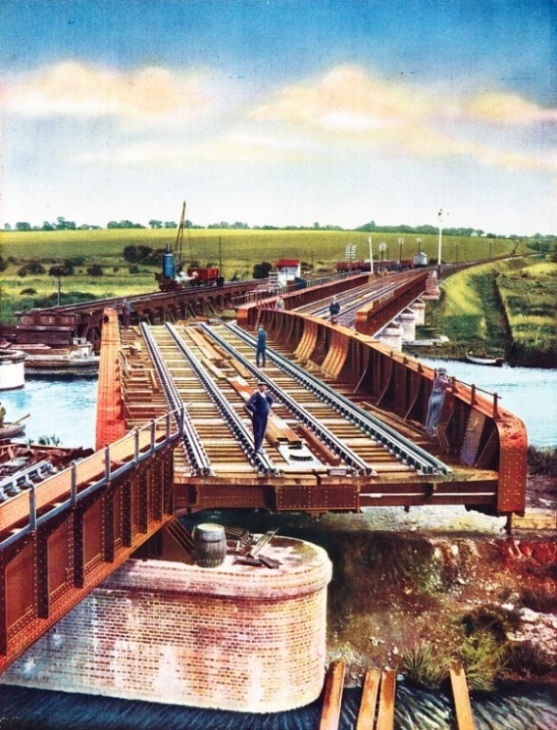 Part 40 includes a colour plate showing a swing bridge on the Ipswich to Yarmouth branch of the London & North Eastern Railway. 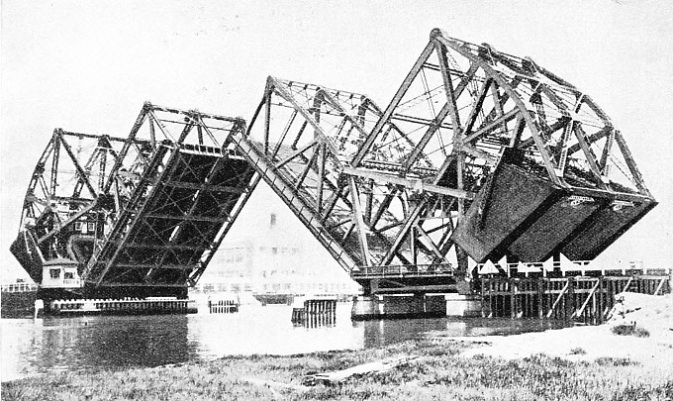 It formed part of the article on Movable Bridges. 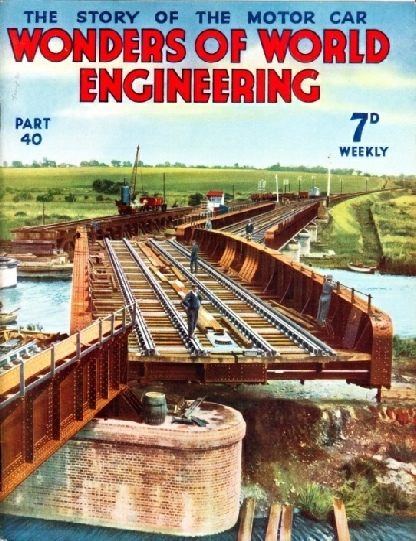 The cover of this week’s Part illustrates the work of the engineer in the rebuilding of British railways. It shows a swing bridge, on the Ipswich toYarmouth branch of the London and North Eastern Railway, across the River Waveney at Beccles, Suffolk. The old structure, built in the late ‘fifties, was hand-operated and carried a single line only. Present-day traffic demands two lines and quicker handling, so a heavier swing span, electrically operated from a signal-box at the south abutment, has been installed. The swing span is 136 feet long and rotates on a large turntable provided with rollers. The swinging is effected through gearing by a 30 horse-power electric motor. There are no great falls of water in the Mississippi, but engineers have been able to use its immense flow to rive thirty huge turbines with an aggregate output of 300,000 horse-power, at Keokuk, Iowa. In the majority of hydro-electric schemes a high head of water is generally necessary to operate the turbines which generate electricity. Until about thirty years ago, therefore, hydro-electric power stations were built only in places where natural conditions provided a sudden and deep fall in a stream. This chapter, by Harold Shepstone, describes the installation of the first power plant using a comparatively low head of water. This power station was completed at Keokuk (Iowa) in 1913, and was made possible by harnessing rapids in the Mississippi River. In a stretch of twelve miles these rapids have a total fall of only twenty-three feet; but a total output of 300,000 horse-power was obtained from this comparatively low head. The project involved the building of a great dam more than 4,500 feet long. Working in such a refractory river as the Mississippi was exceedingly difficult and caused considerable trouble. This article is the sixth in the series Wonders of Water Power. A DAM 4,649 FEET LONG across the Mississippi at Keokuk, Iowa, serves to divert water to the intakes of the turbines in the huge power house. The dam has 119 arched spans, each measuring 30 feet across; the piers are 6 feet thick. 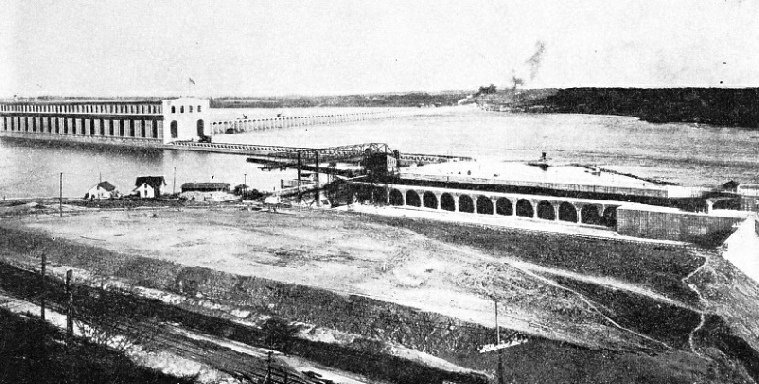 In the foreground is the lock which allows vessels to pass the dam. The lock is 110 feet wide and 400 feet long; it has a lift of 40 feet. On the left is the power house. Many types of rolling, bascule, swing and vertical-lift bridges are in use to-day. Their principles have evolved from early types of movable bridges such as the medieval drawbridge. An attractive colour plate accompanies this informative chapter by C Hamilton Ellis on various types of movable bridges. From time to time Wonders of World Engineering has included, in the popular series “Linking the World’s Highways”, descriptions of the building of certain movable bridges, such as the Tower Bridge and the swing bridge at Kincardine-on-Forth. This chapter, however, deals with the development of the various forms of movable bridges such as the bascule bridge, the swing bridge, the rolling or retractable bridge and the vertical lift bridge. ONE of the most ingenious vehicles developed for engineering purposes is the marsh buggy, which is used in the swamp lands of Louisiana, USA. It travels over roads as a motor car, through swamps as a tractor, and in the water as a boat. When afloat it develops a speed of a little more than six knots. A folding bowsprit and collapsible mast carry the lights necessary for inland water navigation. In swamps and on marshy ground its speed is from ten to twelve miles an hour. On smooth and level ground it reaches a speed of about thirty-five miles an hour. 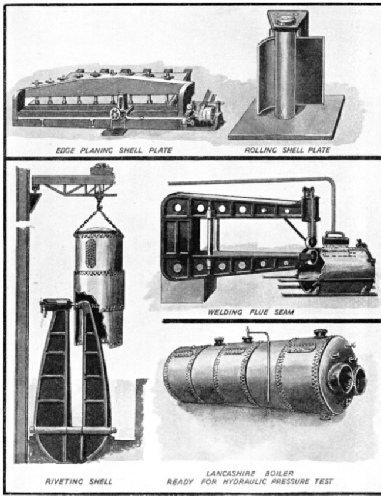 The need for a machine of such unusual versatility arose when geologists predicted that the coastal swamps of Louisiana might have great potential value as a centre for oilfields. Prospectors could not survey this difficult region without some special means of transport for their instruments, and the marsh buggy was evolved to carry the instruments and a surveying platform. Reeds, growing as much as twelve feet above the water of the swamps, were one of the reasons why a surveying platform was essential. 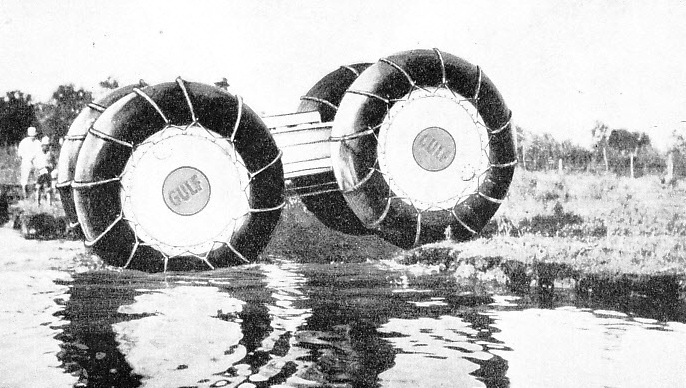 The marsh buggy, illustrated below (without its platform) comprises an aluminium chassis and four aluminium wheels of 5 ft 6 in diameter, to which are fitted large balloon tyres. The tyres, ten feet in diameter and about three feet wide, are inflated to a pressure of from 3 lb to 5 lb per square inch. On land they make springs unnecessary; in the water they give the marsh buggy, which weighs 7,500 lb, or nearly three and a half tons, a draught of less than two feet. Ingenious arrangements have been devised to counter the effects of punctures in the varied conditions in which the buggy may be placed. The aluminium wheels are made in the form of hollow drums, which are watertight and sufficiently buoyant to keep the marsh buggy afloat even with all its tyres deflated. In the event of a puncture occurring while the vehicle is traversing swampy land, the tyre is kept inflated by an air compressor - connected to the tyre through the hub of the wheel - until dry land is reached. The power unit, a Ford V8 engine, is fitted with an ordinary gearbox in series with a tractor gearbox, driving the rear wheels. The front wheels are driven by chains from the back axles. The transmission includes the usual back-axle differential and two brake clutches. One of these is for the nearside and the other for the offside pair of wheels, so that in the water the marsh buggy can be steered to port or to starboard by using the appropriate pair of wheels, or it can be steered straight forward by using all four wheels. On land the steering is much the same as that for a motor car; but the front axle is pivoted, enabling either of the front wheels to rise as much as two feet above the other without tilting the chassis. The total number of speeds provided for in the combined gearboxes is sixteen - ten forward and six reverse. In front, facing the driver, is a vertical control panel with the usual instruments, as well as a compass and water temperature indicator. A short-wave radio transmitter and receiver are provided to enable the machine to keep in touch with its base. This is the twenty-first article in the series Modern Engineering Practice. REINFORCED CONCRETE LANDING STAGE AND VIADUCT at Le Verdon, in the estuary of the River Gironde, some sixty miles from Bordeaux. The landing stage, or jetty, is 1,236 feet long and 126 feet wide. It contains a railway station and is equipped with four electric cranes, each capable of lifting 5 tons. The reinforced concrete viaduct is 1,258 feet long. It carries railway lines and a road. BENDING STEEL PLATES for a boiler drum. When their edges have been planed, the steel plates are bent to the desired curve in great bending rolls. 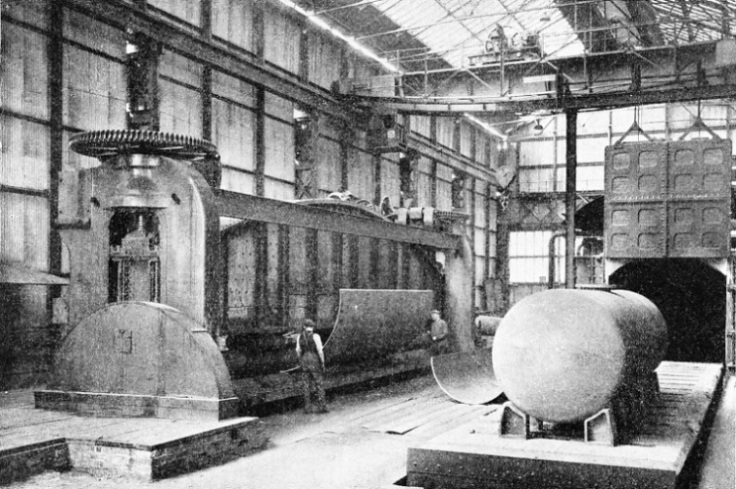 On the right of the photograph is a vessel in position for entering the annealing furnace, which is 46 feet long and is capable of taking a vessel with a diameter of 8 ft 6 in. ONE OF THE LARGEST DOUBLE-BASCULE BRIDGES IN THE WORLD is located near Los Angeles, California. So perfectly balanced are the bascules, with their enormous counterweights, that surprisingly little power is needed to raise or lower the bridge. 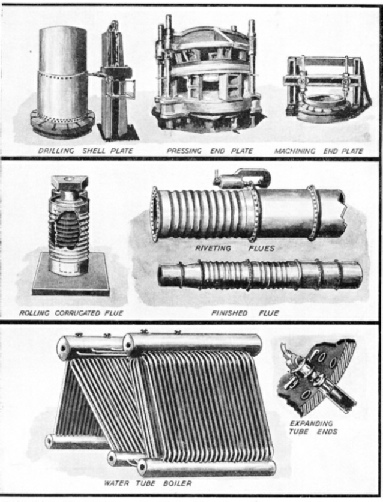 Despite the numerous types and sizes of boilers used in modern engineering, most boilers are made by closely related methods. Drums, end plates and tubes are produced with remarkable care, for much depends on the soundness of the boilermaker’s work. This chapter is by Edwin Judd. SWING BRIDGE across the River Waveney, at Beccles, Suffolk. It carries the Ipswich-Yarmouth line of the LNER. The swing span is electrically operated from a signal box at the south abutment. The span is 136 feet long and rotates on a large turntable provided with rollers. The swinging is effected through gearing by a 30 horse-power electric motor. Large-scale harbour engineering has recently been carried out by engineers of the Port of Bordeaux. Ingenious methods have been adopted in building a jetty for transatlantic liners and an unusual type of suction dredger has been built. Underwater working presents varied problems to the engineer, and many ingenious methods have been evolved. One of the most interesting feats of this nature was recently completed by French engineers, who built a reinforced concrete landing jetty at Le Verdon, in the estuary of the River Gironde, sixty miles below Bordeaux. The jetty is 1,236 feet long; it is joined to the shore by a reinforced concrete viaduct 1,258 feet long. The largest Atlantic liners can be berthed at the jetty. 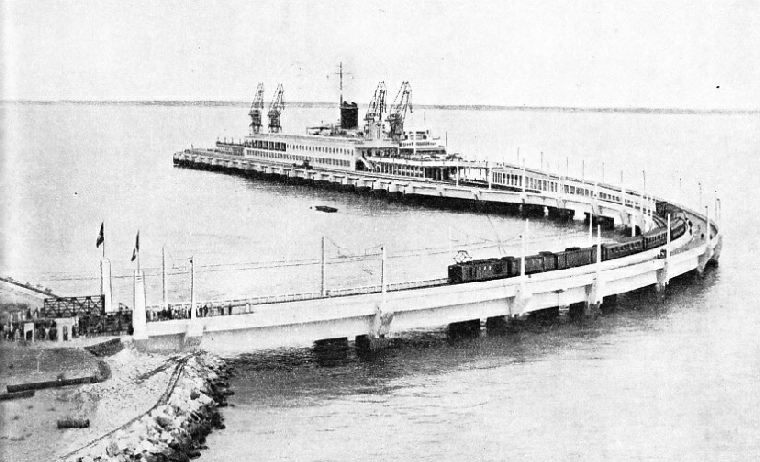 Passengers disembark into the boat train alongside, which conveys them to Bordeaux and saves them a slow voyage up the river to the docks. In this chapter Rolt Hammond describes this and other remarkable feats of engineering which have recently been carried out in the Port of Bordeaux. Motoring had been demonstrated as a practical possibility as early as 1890, but not until 1900 was the motor car a serious challenger in the world of mechanical transport. The period of experiment then gave place to the period of improvement. This chapter is by C Hamilton Ellis and is the second article in the series on the Story of the Motor Car. 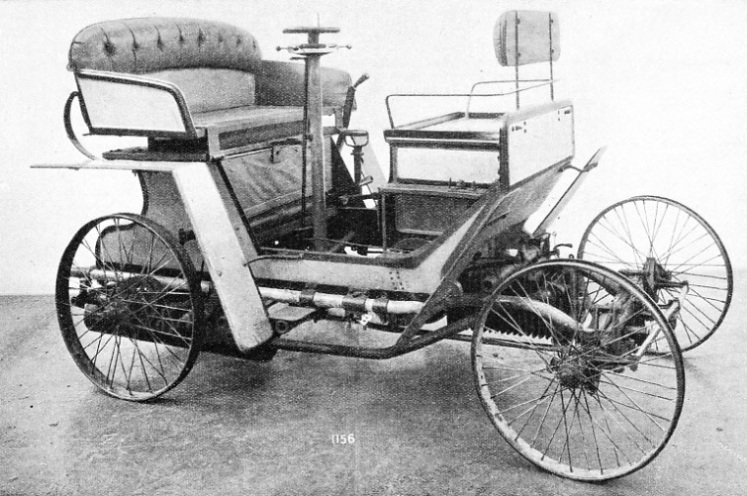 DARRACQ CAR built in 1898. This car had a tubular chassis frame which resembled, in shape, the chassis of many modern cars. The driver and passenger sat facing each other, only the driver’s seat being sprung. Several of the engine controls were grouped at the top of the steering column, thus foreshadowing another feature of the modern car. F E Dean, covers every activity of the famous corps. The article is concluded in part 41. PONTOON AND CABLE FERRY across the River Medway, near Wouldham, Kent. The photograph was taken during training operations carried out by the 4th Division Royal Engineers. 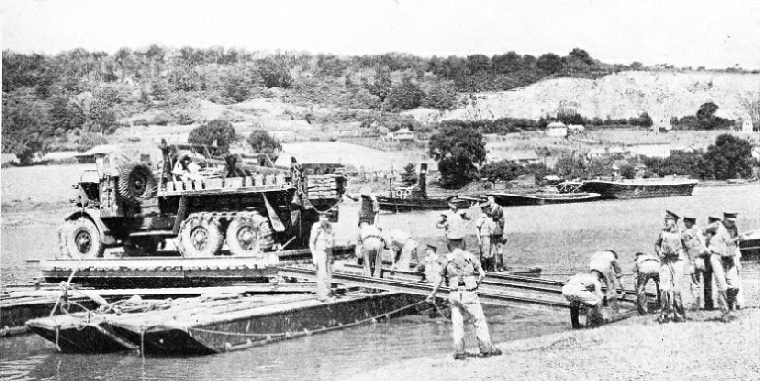 This form of ferry, easily assembled, is used for taking heavy loads across rivers.